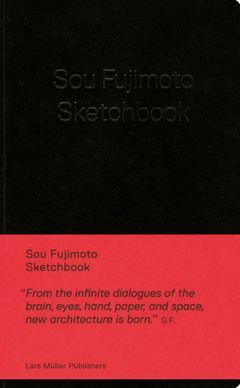 Hardcover, 8.25 x 5 in. / 240 pgs / 248 images. The works of Sou Fujimoto resist any form of conventional categorization. This young Japanese architect stands for unconventional buildings that cannot be described by standard criteria and definitions such as inside/outside or public/private. Clear divisions such as between floor levels and rooms are shattered by his complex ground plans and interlocking structures which—in a reference to the idea of the cave—he describes as “primitive future.” With this approach he creates forms that are committed to a playful interaction between user and space. Alongside private residences, such as the well-known N House, his library for Musashino Art University has achieved particular recognition. In addition he was represented at the 2010 Venice Biennale with a design for a house. In his personal sketchbook Sou Fujimoto offers insights into his design process. 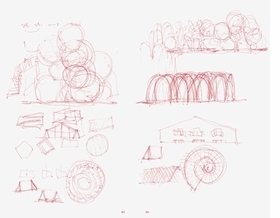 Through the sketches, drawings, and notes readers can trace how his complex concepts are made manifest and develop on paper. Sou Fujimoto, born in Hokkaido, Japan, in 1971, established his architectural practice Sou Fujimoto Architects in 2000. In 2008, he was World Architecture Festival winner in the Private House category, and was awarded a RIBA International Fellowship in 2012. Recently he completed the new library and museum for the Musashino Art University in Tokyo. FORMAT: Hbk, 8.25 x 5 in. / 240 pgs / 248 images.